Trailhead and parking area are at the end of Carriage Road in Gilford, NH. To get there, take Belknap Mountain Road off Rt. 11A, 2.2 miles east of Rt. 3. Travel 2.4 miles and take a left onto Carriage Road. Drive 1.6 miles up this winding dirt road to the large parking area on the left, just before the road ends. Belknap Mountain is the highest peak in the Belknap Range, a long chain of small mountains and hills on the southwest side of Lake Winnipesaukee. Its summit bears one of NH's sixteen active fire towers. From the highest deck, hikers are rewarded with a 360-degree view of the Lakes Region. Many other good viewpoints can be found on the mountain, including a fine one right next to the parking area. Before starting the hike, follow a yellow blazed path from the north side of the parking area to the first viewpoint. At this clearing, follow a path toward the carriage road or return to the parking area and walk out to the carriage road. Turn left and walk up the road past the garage and Warden's Trail (Green Trail) and turn right onto Red Trail. Much climbing is done while driving, but there is still a 700 foot vertical climb on this trail. It is steep and rocky, but short. After a half mile of climbing, a small view is seen in a rocky area. The trail soon becomes easier and, shortly after, emerges in the summit clearing. Standing on the summit, there are no openings; the tower must be climbed in order to obtain a view. The view extends in all directions, though the flat top of the mountain blocks some of the view straight down. The view to the south and to the west is distant; the nearby lake and its surrounding ranges are the focus of the view. The Squam and Osipee Ranges can be seen on the other side, with the Sandwich Range behind. Leave the south side of the summit (opposite the trail you came up) on the White Trail. Another view awaits down this trail. After a 0.2 mile walk over the summit plateau, turn left onto East Gilford Trail and walk a short distance to a wide open ledge with a directional view over the south side of the lake. 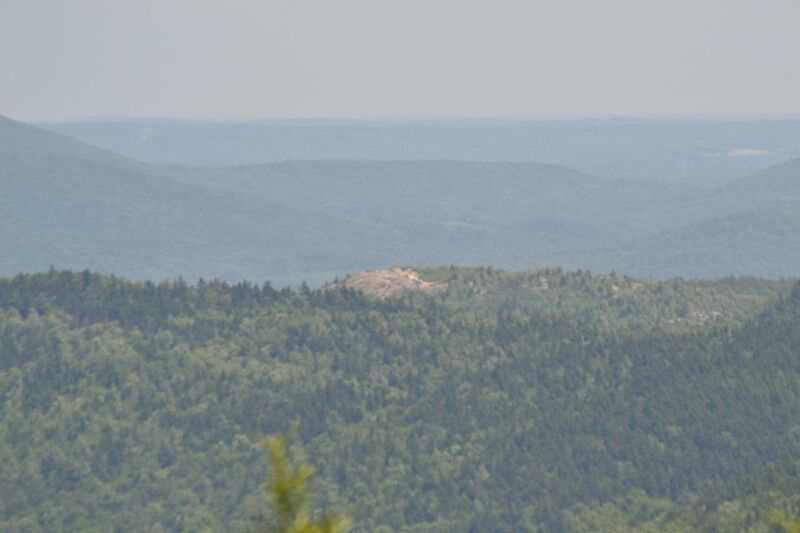 While somewhat similar to a slice of the tower's view, the ledge offers a better perspective of the eastern Belknap Range, including the high-elevation Round Pond, a feature not seen from the fire tower. After enjoying the view, return to the White Trail to complete your loop, descending on gentler terrain and passing by many additional ledges with unique views. In 0.7 miles, you will reach a junction with Round Pond-Piper Link; turn right to continue on White Trail. Then, in 0.2 miles, the White Trail ends at the carriage road, 0.2 miles below the parking area.